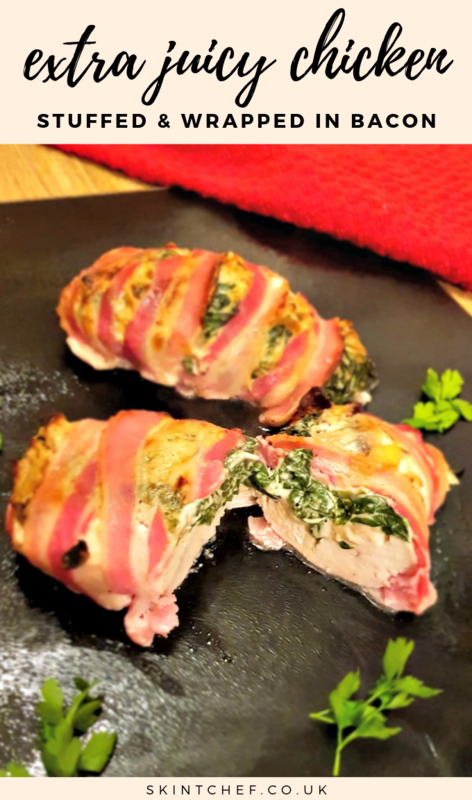 Keep your chicken extra juicy and tender by making stuffed chicken wrapped in bacon. A delicious treat for dinner, or a show stopper to serve friends. Chicken is a bit of a staple in our house. It is so versatile and can go in anything from a yummy Chicken Tikka Masala to Chicken Fajitas. But, cooked on their own they can be a little bit boring (sorry chickens). To pimp up your chicken breast, you only need a few things to take your dinner to a whole new level. Before you can get wrapping, you need to create a tasty filling and prepare your chicken breasts. You need to cut a slit into the side of each chicken breast. You want to slice a little over halfway, but not all the way through. This allows you space to fill the chicken. Stuffing a chicken breast before cooking means it’ll be extra succulent and juicy. 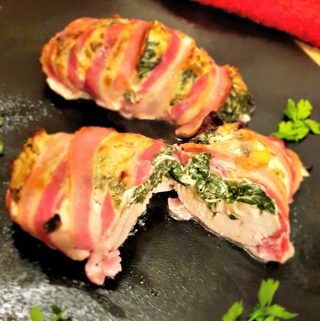 Chicken does tend to go a little dry after baking, but by having a stuffed chicken wrapped in bacon, you’ll get lovely moist chicken. One thing to be aware of is trying to get each piece of chicken to be the same size. This will mean they cook evenly and at the same time. If you need to cut a piece of chicken down to size, save the off cuts to use in a chicken dish later in the week to prevent food waste. 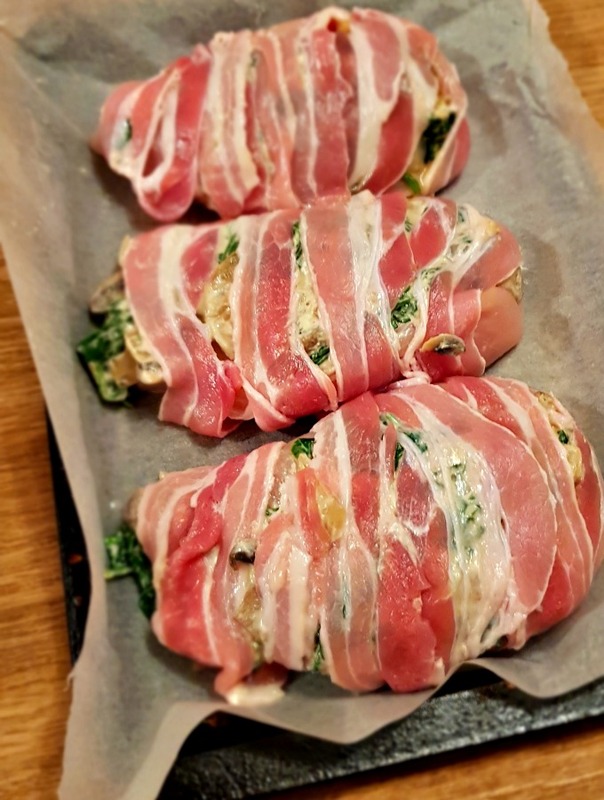 Chicken wrapped in bacon is delicious with mash potato and green vegetables but goes lovely with new potatoes too. Take a breast, place on its side and cut through a third of the way. Once done open it up and place to one side. Do this to all 6 chicken breasts. Fry the onion in oil over a medium heat for about 3-4 minutes. Add the mushrooms and garlic powder and cook for 3 minutes. Add the spinach and cook for a further 2 minutes to reduce down. Remove from heat and place to one side. Place in a bowl the cream cheese, parmesan and mix. Once cooled down add the onions, mushrooms and spinach mix. 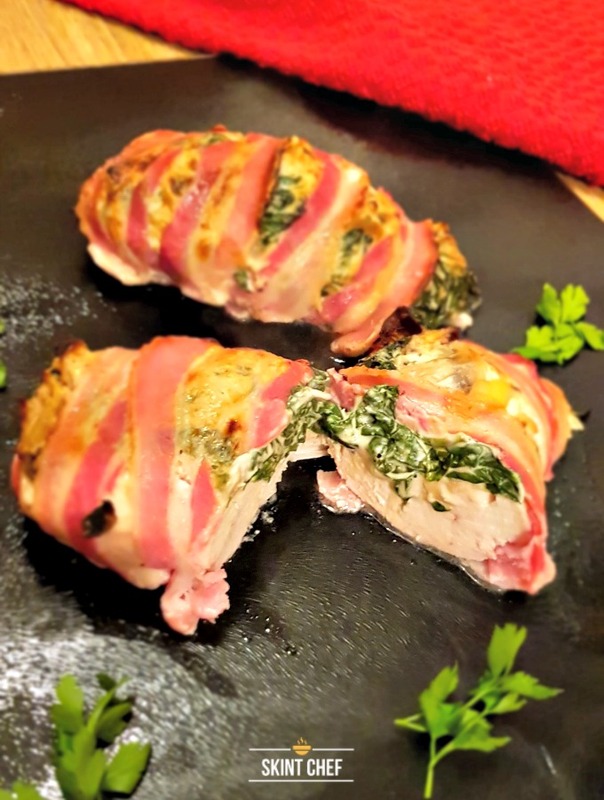 Spoon the mix into the chicken breasts, wrap the filled chicken breasts with streaky bacon. Place on a non-stick roasting tin and cook for 40-45 minutes at 180C until the chicken is thoroughly cooked. Serve with baby new potatoes and vegetables.